Kleeneze is a home shopping company that markets a broad range of cleaning, beauty and homecare products. Its catalogues and magazines are used by home sellers to promote a wide range of products for home delivery in areas such as homecare, laundry, kitchen, home ideas, bed & bath, garden, DIY and health & beauty. 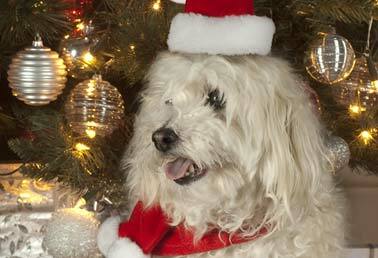 For their most recent assignment, Refinery were looking for one small white dog and a cat to model Santa hats and scarves in Kleeneze’s seasonal brochure, to promote pet products. With the run-up to Christmas being a key marketing period, all the images in the brochure needed to work hard to give Kleeneze’s home distributors every possible chance to maximise their sales. With a very demanding timescale to work to, Models Direct had to pull out all the stops to find the animals required. Models Direct co-ordinators Summer and Lisa took one animal each and got to work, with Summer successfully identifying Enrique, a pedigree Havanese, as the ideal canine model. Lisa came up with Rudi, an eight-month-old Ragdoll cat, and got in touch with his owner, Joanne – just one day after she had registered her pet on the Models Direct website. Another assignment for Refinery caused some consternation at the Models Direct office when it became clear that, despite a broad range of canine models registered, the agency didn’t have a West Highland Terrier on its books – with just one day to go before the photoshoot. Always happy to go the extra mile on behalf of a client, the Models Direct co-ordinators did some rapid research and located a local breeder, June. Animal behaviour is always unpredictable, so clients using pet models are looking for the animals supplied to be as well-behaved as possible. “Once you’re actually shooting, you haven’t got much leeway for things to go wrong,” says Alex. Despite the rush involved in sourcing the animals, the final shots were everything that Refinery and their client had been hoping for, and were duly accorded pride of place in the Kleeneze catalogue.